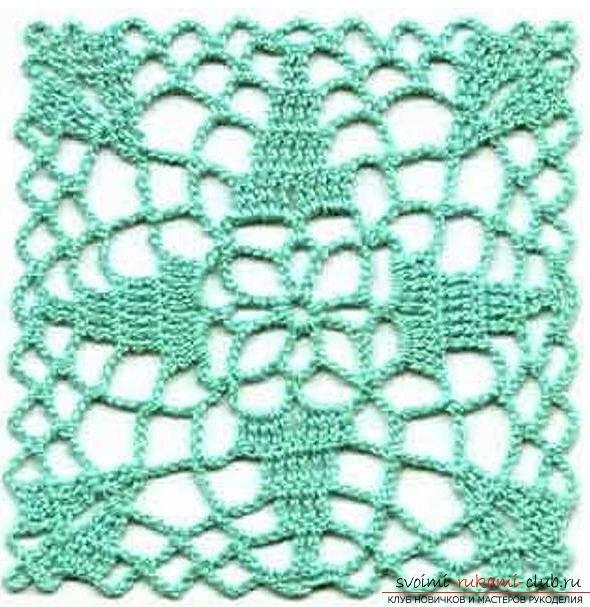 How to tie a square crochet motif, diagrams and a detailed description of the knitting of openwork squares. Crocheted things always lookunusually openwork, original, exclusive and original. A lot of performance techniques and knitting options allow you to create a variety of density and openwork products. 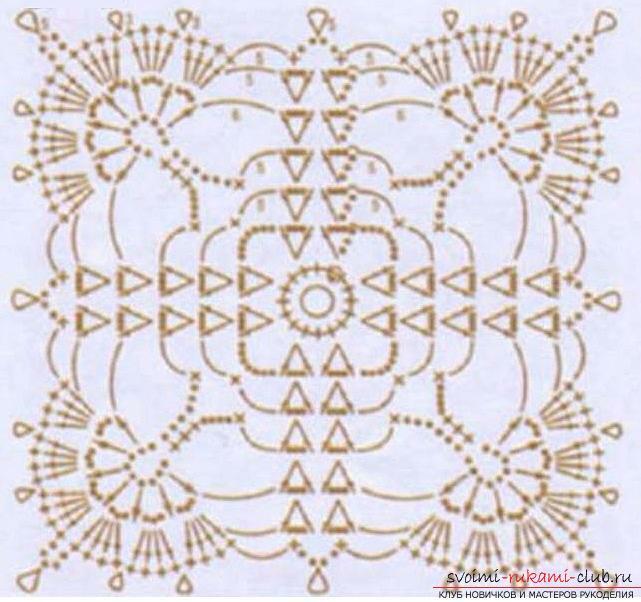 They can be done by tying the whole canvas, performing in the technique of freeforms or making up of separate symmetrical motifs. It can be circles, ovals, triangles, polygons and squares. Perhaps the latter are some of the most popular motifs. Link a small square to the strength of even a beginner, and a little imagination and a correct pattern will help create a real masterpiece. 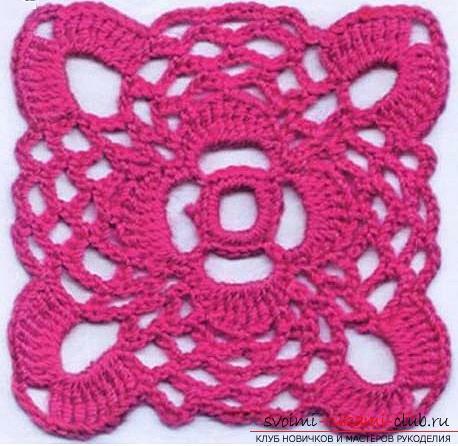 In addition, in such motives, as a rule, a lot of different loops are involved, and it will be very convenient for them to learn how to knit crochets for beginners. Like any other, square motifs can be dense or openwork. Light and lace are perfect for a hot summer, you can create a tunic, a dress, an elegant cardigan, make an openwork in any product, or tie the original edging for it. 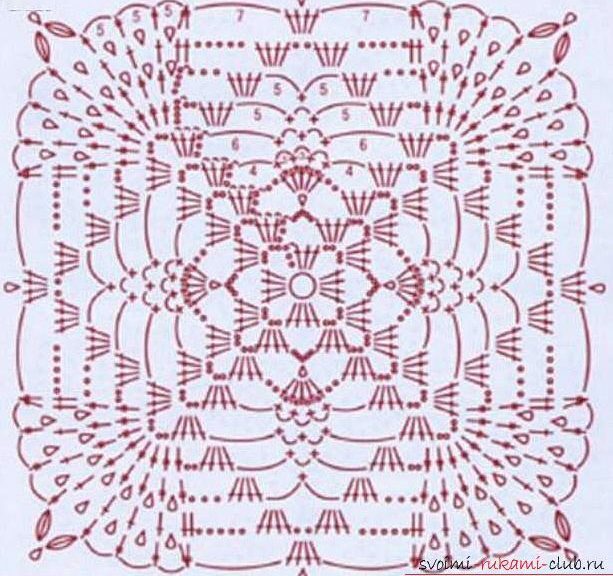 Of the square motifs, you will also get a wonderful tablecloth, napkins or stands for cups or vases. 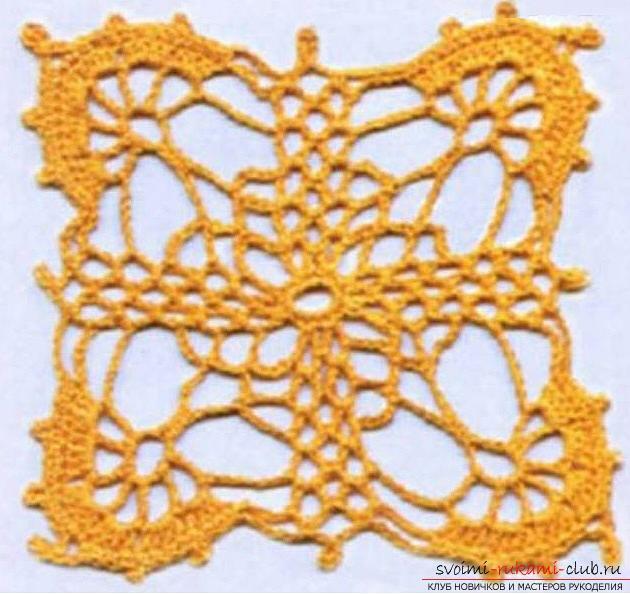 Openwork motifs will also look great in knitted bags or shoes. 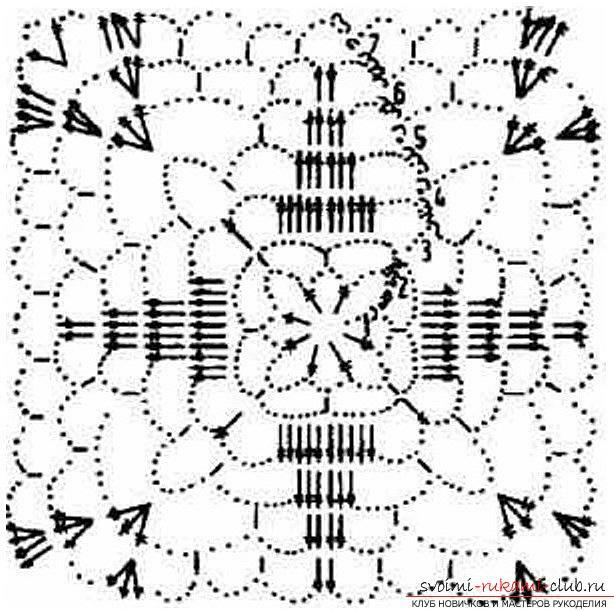 This article is a continuation of the description of openwork square motifs. Square 6. 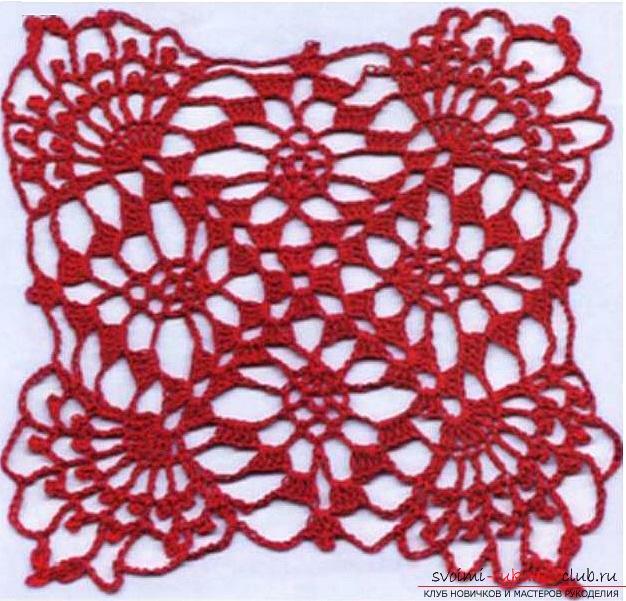 This openwork square is suitable as a component of the bag. The first river. In a ringlet of 10 air loops, tie one air loop of lifting, 19 columns without a crochet, 1 connection. column in the lifting loop. The second river. To knit 4 arches out of 9 air loops, fixing them with 1 bar without a crochet in each. fifth loop of the row. The first column without the mantle is replaced by 1 air lifting loop, finish 1 connection. a column in the loop rise. Third r. In each. (1 stool without crochet + 1 half-loaf with crochet + 3 stitches with crochet + 5 sticks with 2 napes + 3 stitches with crochet + 1 half-loaf with crochet + 1 stile without crochet), replace the first column with the crochet by 1 air lifting loop , finish 1 connection. column. Fourth р. To spend 1 air. lifting loop, * 4 arches out of 5 flights. loops, fixed 1 tbsp. without a crochet in each. the third loop of the row, 5 air. loops, 1 tbsp. without a crochet in a half-barrel with a crochet, * tie from * to * 3 more times, replacing the last arch by 2 air. loops + 1 tbsp. with a crochet in the lifting loop. The Fifth River. To spend 1 air. a loop of lifting, to fasten with arches from 5 air. loops, fixing them 1 tbsp. without a crochet in the middle of each. arch of the row below, the last arch replaced by 2 air. loops + 1 tbsp. with a crochet in the air. lifting loop. The Sixth River. To spend 1 air. lifting loop, * arch of 9 air. loops fixed 1 tbsp. without a crochet on the trail. arch of the row below, 4 arches out of 5 flights. loops, fixed 1 tbsp. without a crochet in the middle of the arches of the row below *, tie from * to * 3 more times, the last arch to be tied as 2 air. loops + 1 tbsp. with a crochet in the lifting loop. Seventh r. To spend 1 air. lifting loop, * in the arch of 9 air. loops knit (8 sts with crochet + 5 air loops + 8 sts with crochet), 3 arches out of 5 flights. loops, fixed 1 tbsp. without a muffin in the centers of the arches of the row below *, repeat from * to * 3 more times, finish 1 connection. a column in the lifting loop. The first river. In the ring of 8 air. loops tie one air. lifting loop, 15 tbsp. without a crochet, to finish a series 1 соед. a column in the lifting loop. The second river. To knive 3 air. lifting loops (in all other cases, replace with * 1 item with a cuff), 3 air. loops, 1 tbsp. with a crochet in the same loop of the base, 1 loop through, in the trail. Art. without a napkin to tie (1 item with a crochet + 3 air loops + 1 st. with a crochet), 7 air. loops, 1 loop to pass *, tie from * to * 3 more times, 2 wires. column. Third r. To knive 3 air. lifting loops (in all other cases, replace with * 1 item with a cuff), 3 air. loops, 1 tbsp. with a crochet in the same arch of 3 flights. loops, in the trail. arch of 3 vehicles. loops to tie (1 item with a crochet + 3 air loops + 1 item with a cuff), 5 air. loops, 1 tbsp. without a crochet in the arch of 7 air. loops, 5 air. loops *, tie from * to * 3 more times, finish 1 connection. a column in the third lifting loop. Fourth р. To knive 3 air. lifting loops (in all other cases, replace with * 1 item with a cuff), 3 air. loops, 1 tbsp. with a crochet in the same arch of 3 flights. loops, in the trail. arch of 3 vehicles. loops to tie (1 item with a crochet + 3 air loops + 1 item with a cuff), 5 air. loops, 1 tbsp. without a crochet, 15 air. loops, 3 tbsp. without a crochet in the 10th, 11th and 12th loops from the hook, 4 air. loops, 1 tbsp. without a crochet in the arch of 5 air. loops, 5 air. loops *, repeat from * to * 3 more times, finish 1 connection. a column with a third lifting loop. The Fifth River. To knive 3 air. lifting loops (in all other cases, replace with * 1 item with a cuff), 3 air. loops, 1 tbsp. with a crochet in the same arch of 3 flights. loops, in the trail. arch of 3 vehicles. loops to tie (1 item with a crochet + 3 air loops + 1 st with a crochet), 6 air. loops, in a ring formed from 9 air. loops to tie (1 item with a crochet + 3 times a loop 6 times + 1 st with a cuff), 6 air. loops *, tie from * to * 3 more times, finish 1 connection. a column in the third lifting loop. The Sixth River. To knive 3 air. lifting loops (in all other cases, replace with * 1 item with a cuff), 3 air. loops, 1 tbsp. with a crochet in the same arch of 3 flights. loops, in the trail. arch of 3 vehicles. loops to tie (1 item with a crochet + 3 air loops + 1 item with a cuff), 5 air. loops, in each. arch of 3 vehicles. loops to tie in 4 tbsp. with a crochet, 5 air. loops *, tie from * to * 3 more times, finish 1 connection. a column in the third lifting loop, 1 connection. bar in the first air. loop of the series. Seventh r. To spend 1 air. a loop (in the remaining cases * 1 item without a cape), 2 air. loop + pico + 2 air. loops, 1 tbsp. without a crochet in the arch of 3 air. loops, 5 air. loops, 4 tbsp. without nakida, pico, 4 tbsp. without nakida, pico, 4 tbsp. without a crochet, 5 air. loops with pico in the center, 4 tbsp. without nakida, pico, 4 tbsp. without nakida, pico, 4 tbsp. without a crochet, 5 air. loops *, continue from * to * 3 more times, finish 1 connection. a column in the lifting loop. The first river. In the ringlet of 4 air. loops tie 4 air. lifting loops, * 9 air. loops, 1 tbsp. with 2 nakidami, 4 air. loops, 1 tbsp. with 2 nakidami *, knit from * to * 3 more times, replace the last st. with 2 covers for 1 connection. A column in the fourth loop of the lift. The second river. 8 arches from 9 air. loops, fixing them 1 tbsp. without a crochet in the middle of the arches of the row below. Third r. Spravat 4 air. lifting loops, * 7 air. loops, tie 2 times for 5 tbsp. with 2 nakidami in 2 adjacent arches, 7 air. loops, 1 tbsp. with 2 nakidami in art. without a crochet, * from * to * 3 more times, replacing the last st. with 2 covers for 1 connection. A column in the fourth loop of the lift. Fourth р. To communicate 3 соед. column, 1 air. lifting loop, * 9 air. loops, skip 1 tbsp. with 2 nakidami, 6 tbsp. with 2 nakidami, 9 air. loops, 1 tbsp. without a crochet in the arch of 7 air. loops, 11 air. loops, 1 tbsp. without a crochet on the trail. arch of 7 air. loops *, continue from * to * 3 more times, replace the last st. without a crochet for 1 connection. column in the lifting loop. The Fifth River. To communicate 3 соед. column, 1 air. lifting loop, * 6 air. loops, skip 1 tbsp. with 2 nakidami, 4 tbsp. with 2 nakidami, 6 air. loops, 1 tbsp. without a crochet in the arch of 9 air. loops, 8 air. loops, in the middle loop of the arch of 11 air. loops tie 3 tbsp. with 2 nakidami, 8 air. loops, 1 tbsp. without a crochet in the arch of 9 air. loops * continue from * to * 3 more times, last st. without a crochet, replace it with 1 c. column in the lifting loop. The Sixth River. To communicate 2 соед. column, * 6 air. loops, skip 1 tbsp. with 2 nakidami, 2 tbsp. with 2 nakidami, 6 air. loops, 1 tbsp. without a crochet in the arch of 6 air. loops, 6 air. loops, 1 tbsp. without a crochet on the trail. arch, in 1 tbsp. with 2 nakidami, tie 3 tbsp. with 2 nakidami, 3 air. loops, 1 tbsp. with 2 nakidami miss, in the third century. with 2 nakidami knot 3 tbsp. with 2 nakidami, 6 air. loops, 1 tbsp. without a crocheting in the arch, 6 air. loops, 1 tbsp. without a crochet on the trail. arch *, continue from * to * 3 more times, instead of the last st. without a crochet to tie 1 c. column in the lifting loop. Seventh r. To communicate 3 соед. column, 1 air. lifting loop, * 5 air. loops, 1 tbsp. without a crochet in the arch of 6 air. loops, 5 air. loops, 1 tbsp. without a crochet on the trail. arch, 5 air. loops, 1 tbsp. without a crochet on the trail. arch, 5 air. loops, in 1 tbsp. with 2 nakidami tie 2 tbsp. with 2 nakidami, 2 tbsp. with 2 nakidami, 3 air. loops, in the arch of 3 air. loops to tie (1 item with 2 nakidami + 3 air loops + 1 st. with 2 nakidami), 3 air. loops, 2 tbsp. with 2 nakidami, in 1 tbsp. with 2 nakidami tie 2 tbsp. with 2 nakidami, 3 arches from 5 air. loops, fixed 1 tbsp. without a crochet in the middle of the arches of the row below, * from * to * 3 more times, instead of the last st. without a crochet to tie 1 c. column in the lifting loop. Square 9. 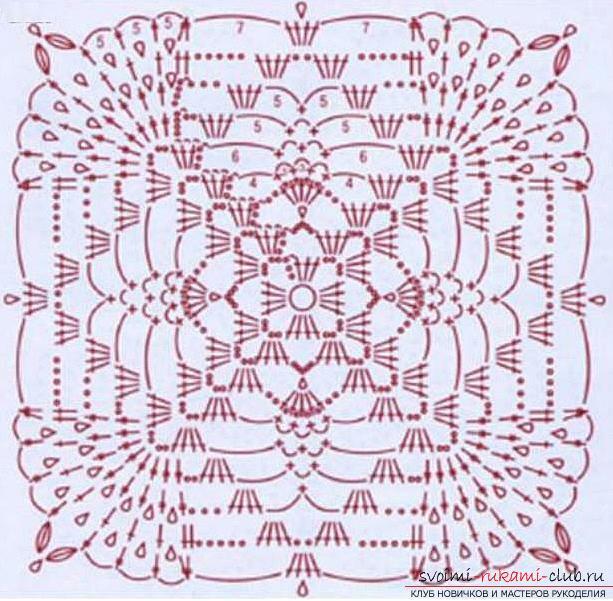 Of these motifs, you will get a wonderful stole or a summer cardigan. The first river. In the ringlet of 5 air. loops tie 3 air. lifting loops, * 4 air. loops, 4 tbsp. with a crochet *, from * to * 2 more times, 4 air. loops, 3 tbsp. with a crochet, 1 c. a column in the third loop of lifting. The second river. To communicate 1 connection. column, 3 air. loops of lifting (in all other cases, tie * 1 st with nakidom) in the same arch to tie (3 items with a crochet + 4 air loops + 4 sts with a crochet), 5 air. loops with a pico in the center *, tie * from * to * 3 more times, finish 1 connection. a column in the third lifting loop. Third r. To communicate 4 соед. column, 3 air. loops of lifting (in all other cases, tie * 1 st with the crochet) in the same arch to tie (3 items with a crochet + 4 air loops + 4 sts with a crochet), 2 air. loops, in picos to tie (1 item with a crochet + 1 air loop 4 times + 1 st with a crochet), 2 air. loops *, knit from * to * 3 more times, finish 1 connection. a column in the third lifting loop. Fourth р. To communicate 4 соед. column, 3 air. loops of lifting (in all other cases, tie * 1 st with the crochet) in the same arch to tie (3 items with a crochet + 4 air loops + 4 sts with a crochet), 4 air. loops, 3 arches out of 3 flights. loops attached 1 tbsp. without a crochet in 1 air. a loop alternating with 1 tbsp. without a cape, 4 air. loops *, continue from * to * 3 more times, finish 1 connection. a column in the third lifting loop. The Fifth River. To communicate 4 соед. column, 3 air. loops of lifting (in all other cases, tie * 1 st with nakidom) in the same arch to tie (3 items with a crochet + 4 air loops + 4 sts with a crochet), 6 air. loops, 2 arches out of 3 air. loops, fixed 1 tbsp. without a crochet in the middle of the arches from 3 flights. loops of row below, 6 air. loops *, continue from * to * 3 more times, finish 1 connection. a column in the third lifting loop. The Sixth River. To communicate 4 соед. column, in the arch of 4 air. loops to tie (4 lift loops (in the following cases * 1 item with 2 nakidami), 7 items with 2 nakidami), 2 air. loops, 4 tbsp. with a crochet in an arch of 6 air. loops, 5 air. loops, 1 arch of 3 air. loops fixed by art. without a crochet in 2 arches row below, 5 air. loops, 4 tbsp. with a crochet in an arch of 6 air. loops, 2 air. loops *, continue from * to * 3 more times, finish 1 connection. a column in the fourth loop of lifting. Seventh r. Spravat 4 air. lifting loops (in the following cases * 1 item with 2 nakidami), in each. Art. with 2 nakidami to tie (1 item with 2 nakidami + piko, only 7 picos), 3 air. loops, 4 tbsp. with a crochet in an arch of 5 flights. loops, 5 air. loops, 1 tbsp. without a crochet in the arch of 3 air. loops, 5 air. loops, 4 tbsp. with a crochet in an arch of 5 flights. loops, 2 air. loops *, continue from * to * 3 more times, finish 1 connection. a column in the fourth loop of lifting. Eighth r. To knive 3 air. lifting loops (in the following cases * 1 item with a cuff), 1 tbsp. with a cuff, to tie in the same way as the previous row, alternating Art. with a crochet and pico, 1 tbsp. with a crochet in an arch of 3 flights. loops, 5 air. loops, 4 tbsp. with a crochet in an arch of 5 flights. loops 2 air. loops, 4 tbsp. with a crochet in an arch of 5 flights. loops, 5 air. loops *, tie from * to * 3 more times, finish 1 connection. a column in the third lifting loop. The ninth river. Spravat 4 air. lifting loops (in all other cases, replace with * 1 item with 2 nakidami) and 1 tbsp. with 2 nakidami with one top, 3 arches from 5 air. loops, fixed 1 tbsp. with 2 nakidami in 3 tbsp. with the crochet of the row below, 3 tbsp. with a crochet with one top and base, pico, 3 tbsp. with a crochet with one vertex and a base in the trail. 1 tbsp. 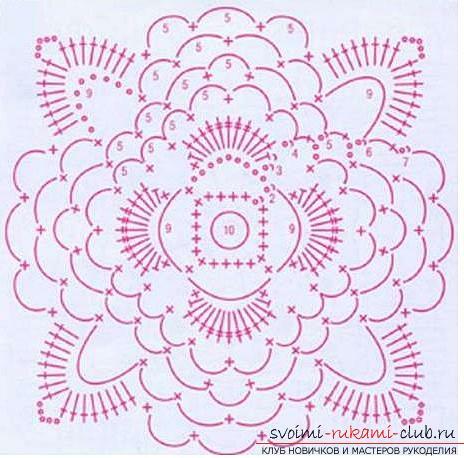 with 2 nakidami the ninth row, tied from 1 tbsp. with the crochet of the eighth row, 5 air. loops, 1 tbsp. with 2 nacs in the trail. Art. with a row of rows below, 5 air. loops, 1 tbsp. with 2 nakidami, 5 air. loops, 2 tbsp. with 2 nakidami with one top, 7 air. loops, in the arch of 2 air. loops to tie (2 items with a crochet + picot + 2 items with a cuff), 7 air. loops *, tie from * to * 3 more times, finish 1 connection. a column in the fourth loop of lifting. After the square is connected, it is necessaryevaporate, or moisturize and dry on a flat surface. To give shape, you can pin it with corners. In this case, the square will somewhat change its dimensions, which must be taken into account in the subsequent connection to the common fabric of the product. The squares are joined either in the process of tying the last row into all the loops, or in pico or arches from the air. loops. How to make a brilliant hairstyle for a charming bride with your own hands.